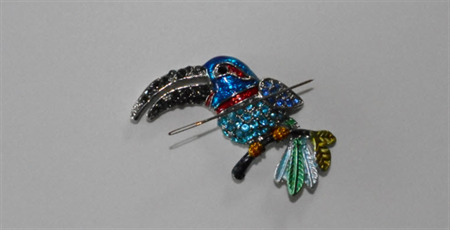 This lovely Blue Toucan needle minder will ensure your needle doesn't disappear and then reappear in inconvenient (and painful) places. INSTRUCTIONS: Place the decorative Needle Minder on the front of the fabric. Secure it in place underneath the fabric using the backing magnet supplied. Place your needle(s) on top of the decorative Needle Minder and they will be magnetised in place. NEVER LOSE YOUR NEEDLE AGAIN!